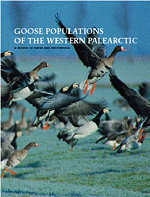 From February 1991 till November 1996 regular bulletins were mailed to interested goose biologists from the National Environmental Research Institute in Kalø, Denmark. The 8th and last issue appeared in November 1996. Since October 2009, this bulletin appears twice per year in a digital form. The latest edition of the Wildfowl journal are now also available online, for free, at http://www.wwt.org.uk/what-we-do/publications/wildfowl/archive/wildfowl-issue-61/.